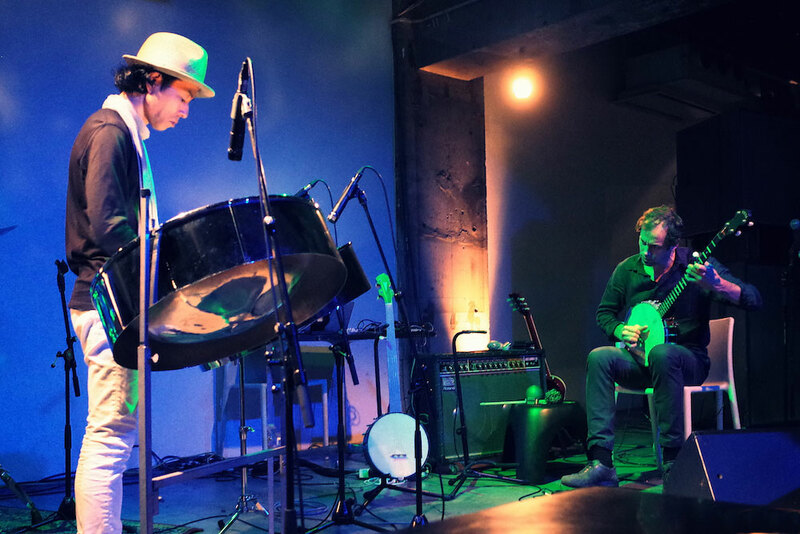 Cal Lyall (banjo) and Yoshio Machida (steelpans, metal slit drum) present the latest incarnation of their long-running improvisational duo. Cal Lyall’s approach to banjo is influenced by a range of folk music styles, from Moorish finger style to the sounds of the Burmese harp, while Yoshio Machida’s steelpan playing borrows many ideas from traditional Indian music. Don’t miss your chance to hear this unusual acoustic match up in Shimauma’s intimate setting. ＊If you wish to attend, please make a reservation via salon@shima-uma.co.jp with the title「Shimauma unplugged」and the following information > your full name, number of participants and contact number. Yoshio Machida is a sound & visual artist, Steel Pan player. Born in Japan in 1967. He studied minimal art / music / film extensively under Kuniharu Akiyama, Yoshiaki Touno, Sakumi Hagiwara, Kishio Suga at Tama art university in Tokyo. Machida has played for art events / music festivals like ISEA2004, Sonar-Tokyo, Europhonics Jazz Festival, Maerz Musik Festival, etc.. He has been introduced in David Toop’s book “Haunted Weather” and the compilation album “Japanese Avant Garde” (Sub Rosa, 2002). In the 90s, he was involved in international cooperation work in Asia, Africa and Mexico. Through this experience, he had opportunities to listen to rare ethnic musics and learned a lot. He was especially inspired by music, ceremony and culture based on Pan-East Asian sun worship basis, then he had come out with collage painting and field recording works “Hypernatural series” featuring Asian gong (the symbol of light and the sun in Asian culture). He also became interested in live music and started to perform improvised music with Steelpan (steel drum). In 2004, Machida founded AMORFON, a music label and platform for contemporary art events. He has released his solo albums, unique work from Eastern European artists, and “Kindermusik: Improvised Music by Babies.” Machida also writes for magazines, has lectures and some unique workshops for children. Involved in the arts scene in Japan for over fifteen years, Cal Lyall has organized large-scale performances involving both Japanese and overseas artists, while also remaining a key member of a number of musical groups which have toured both locally and internationally. His musical activities are documented on over 30 albums he has both produced (including three full-length compilations released on medama records in Japan) and contributed to as a writer or musician. As a curator, he established the monthly Test Tone concert series in 2005 at Tokyo’s SuperDeluxe. Featuring over a thousand distinct artists over its 9 year run, it reached its 100th installment in 2014. With an active performance schedule in Japan and past tours through Thailand, Laos, Indonesia, China, Korea, Australia and the US, he also heads up the Subvalent record label and oversees the Tokyo Hub of Jolt Sonic Arts (Australia).